In line with the concept ‘Share Your Light’, the Tokyo 2020 Paralympic Torch will be created in Tokyo in August 2020 by the coming together of the collective passion of everyone who is supporting the Paralympics. The torch for the Tokyo 2020 Paralympic Torch Relay will symbolise the coming together of the sentiments of everyone involved with and supporting the Paralympic Games. The torch for the Tokyo 2020 Paralympic Torch Relay has been created in a traditional form using the aluminium extrusion manufacturing technology used in the production of the shinkansen bullet train. Completely seamless – produced from a single sheet of metal. A form that symbolises the Tokyo 2020 Torch Relay created by Japanese tradition and advanced technological capabilities. Part of the material from which the torch for the Tokyo 2020 Paralympic Torch Relay is made is recycled aluminium* originally used in the construction of prefabricated housing units in the aftermath of the Great East Japan Earthquake. The temporary units used to house those affected by the disaster have been transformed into the torch for the Tokyo 2020 Paralympic Torch Relay as a symbol of peace, and communicate the efforts taken toward reconstruction of the disaster-affected areas. * Approx. 30% of the torch for the Tokyo 2020 Paralympic Torch Relay is made from recycled aluminium. 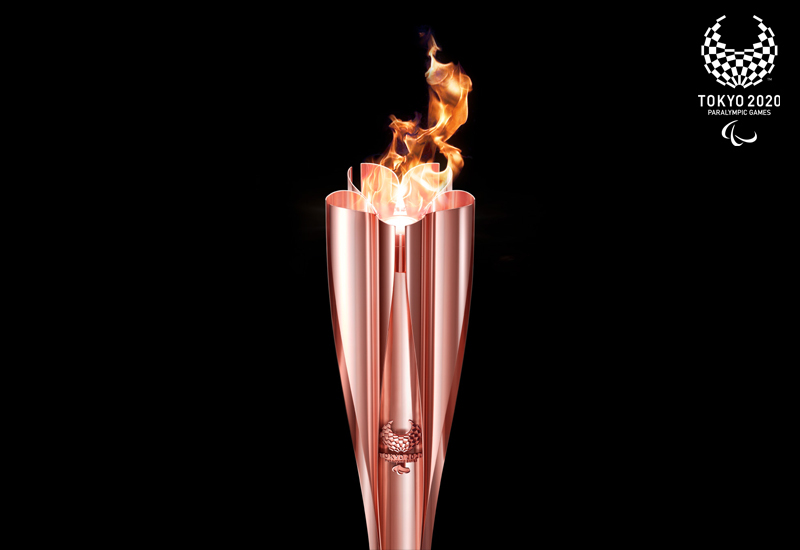 The torch for the Tokyo 2020 Paralympic Torch Relay has been designed in the form of a sacred flame. Five separate flames emerge from flower petals and come together as one at the centre of the torch to give off a more brilliant light. Several technical features have been added in the production of the torch, including the adoption of a mechanism with a blue flame with strong thermal capabilities and a flameless combustion component (catalytic reaction), which together keep the flame alight. As the sun goes down and the August days grow dark, the torch will burn brightly and light up the town. The weight and grip of the Tokyo 2020 Paralympic Torch have been specially produced to ensure that it is easy for absolutely anyone to hold – regardless of age or gender. Total weight: 1.2kg (the torch weighs 1kg, while the fuel part 0.2kg). Planning, design and overall supervision: Tokujin Yoshioka Inc. Combustion mechanism: Shinfuji Burner Co., Ltd.
Tokyo 2020 invited applications from joint enterprises to undertake all production aspects of the torch – from design through to actual manufacturing. The torch for the Tokyo 2020 Paralympic Torch Relay was selected after two separate meetings of a panel of experts from a wide range of fields. The Selection Committee cited the outstanding design, the capabilities of the combustion mechanism to light the flame, and the sustainability of the torch as major reasons behind its selection. Executive Officer & General Manager Production Engineering div. The Tokyo 2020 Paralympic Torch Relay Emblem has been designed from the perspective of consistency with the Tokyo 2020 Paralympic brand and easy recognition as part of the brand family. The three rectangular shapes that make up the Tokyo 2020 Games emblems have been redesigned to resemble the flame of a torch, and express the dynamic movement of a flame. The design also incorporates the fuki bokashi technique for colour gradation often used in traditional Japanese ukiyoe painting to further imbue the emblem with a Japanese aesthetic. Traditional Japanese colours have been used to emphasise the flame of the Tokyo 2020 Paralympic torch. A combination of gold and yellow ochre is featured to depict the brilliance of diverse personalities, which together create an overall sense of a Japanese-style festival and expectations for the Tokyo 2020 Paralympic Games. The light of the Paralympic torch represents countless encounters among people and widespread mutual acceptance. In August 2020, thanks to the Paralympic Torch Relay, this light will shine brightly on the new society that will emerge from the interactions of people from around the world. Commentaires fermés sur Paris 2024 : nouveaux partenaires pour une nouvelle ère !